The MVP UltraMAX FIT Gelcoat system features the lowest pressure pumping system available, easy setup, easy operation and easy maintenance with Magnum Venus Products’ renowned durability. Fewer parts, stainless steel where you need it, and a rugged design, combine to make this system the operator’s choice. 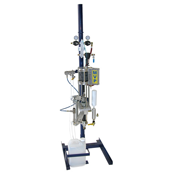 Featuring the innovative UltraMAX pumping system that utilizes a heavy duty stainless steel catalyst pump, this machine allows the operator to adjust the preferred setting with ease. Infinite catalyst settings available with a simple adjustment. Built with modular components to create the optimum configuration for your needs, and keeps you running. Utilizing quick-change components extends the system life and allows for little or no down time. The major components change out in 10 minutes or less. Choose your preference: available in internal mix and airless air assist configurations that both deliver versatile spray and impinge gelcoat performance. Call today! Together we can create the perfect UltraMAX unit for you!